Another exciting installment of the 2010 AMA Monster Supercross Series! With Ryan Dungey(#5) on top of the points lead, he planned on putting more distance the other riders today. Dungey came out strong in his heat race, but had a rare crash coming off a jump and hitting a barrier. He was able to gather himself, right his bike, and get back on the track quickly however finishing in the top of the pack to secure a place in the main event. Dungey got the hole shot in the main and immediately started to add distance, running away with the lead with Josh Hill in second and Ryan Villopoto(#2) in third. About halfway through lap ten, on the same jump that he wrecked on before, Dungey cross rutted and sent the bike nose high into the air off the jump. With the bike out in front of him, he landed hard on both legs on the ground. Amazingly, he was able to jump up and get back on his way without loosing the lead! Unfortunately the clutch lever on the bike got twisted around the back on the crash making for an awkward reach. He was passed by Hill, Villopotto, then Millsaps, but was able to finish 4th to salvage his points lead for the series. Villopotto got his first win of the season and made up some distance in the points. 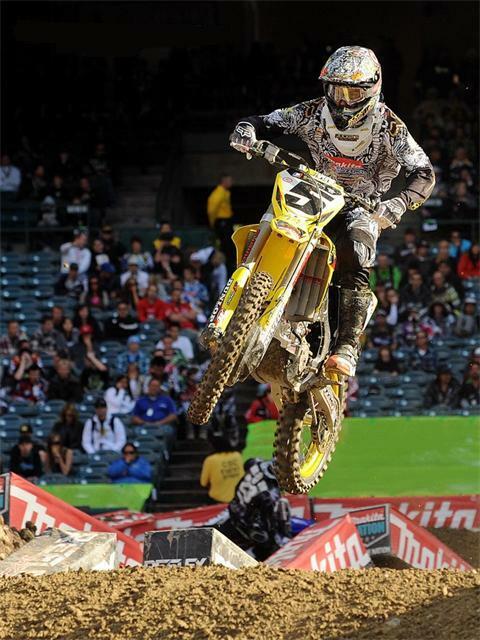 With James Stewart out with a broken wrist and Reed still out with a broken hand the young guns are taking advantage. This type of crash may well be a testament to the Nike 6.0 Boots, it seems as though Dungey escaped injury free. This video shows the wreck, pretty lucky to escape without injury. It seems as though he did a good job of rolling with the hit to disperse the energy. Absolutly incredible what they do with their bikes. So true, should be a nice installment this weekend..I think on CBS Sunday morning.